As an avid gardener and design professional, I understand the importance of getting another opinion. Long ago I left my ego at the curb, gaining the confidence to ask for help. Decisions about a design element that would paralyze me in my own garden were the same ones I could easily make for my clients. Sometimes we just need to step away from something that is too familiar and ask for help. If you feel like the whole process of creating a garden is overwhelming and daunting, help is but a conversation away. Ask a friend who designed her garden, assuming you like it, and even search the web to see the work of designs you like. Hiring a landscape designer can be your best outdoor investment. Many homeowners like to tinker with their own designs and conceptions. 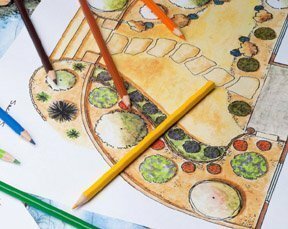 Many more want to install their own gardens, but still rely on various professionals to help with certain steps along the way. Before you do your own final design, you may want to talk with a design professional. A designer can help with patios, decks and dining areas, as well as where to site children’s play sets. They can help you consider and place shade structures, rain gardens, a pool, or spa. The placement of these elements into the design will give you a coherent plan, saving you heartaches later. Even if your wish list doesn’t currently fit your budget, if it’s ever a possibility, adding it to a master plan will allow for the garden to grow when your budget is ready. Working with a designer who has a strong interest in horticulture will help you with selections and care of your garden plants. As with most professionals, each gravitates towards a niche. When I added steps up an incline and through my mixed border, I went to a professional who specialized in this kind of design. It was the best decision I ever made for my landscape, and I don’t say that lightly. I waited 10 years to have the budget and inclination to make it happen. Before your first visit with a landscape designer, make a list of all your wishes and wants. Identify any problem areas you would like addressed. The best part of having a master plan is it will carry you through the process of building your garden as resources become available. Not all the work needs to be done at once. Reading the pages of magazines is one of the best ways to quickly identify your gardening style. It’s like reading tea leaves. There are messages in the pages. Look to these messages as each page points to patterns you repeatedly choose, like gravitating to hot colors of red and purple. Perhaps you found you bent the corner of every page that was a mix of jumbled up plants or those filed with specimen plants. Identifying these messages will help you and your designer plan your garden.